Rights, human rights, come from God and the role of government is to preserve and protect those rights. The sphere of government was seen by the founders as a tool which God used, and as such the government was subject to God. Over the past century, a battle has been waged in the U.S. between the Federal government and the church, or perhaps better understood as a battle of the government against the church. Ultimately the battle was against the individual as well, since the individual in America made his or her own decision as to which church, or no church, that he or she would allow to influence his or her behavior and thinking. The battle is about control. Who controls the people? Who controls religious expression? Who sets the moral compass? On the “progressive” side there has been a steady push to expand government control in each of these areas, over the rights of the individual and the church, even as the government itself trended further left and further into godlessness. In other words, the Federal government has been engaged in aggressively pushing the populace further left, and as far away as possible from its foundational religious moorings. In order to effectively accomplish this, the people had to be encouraged to see the government as their “god.” A new god means new rules, new morals. America’s “old God,” the God of the Bible, with all his old fashioned morality, had to go. The Ten Commandments had to be removed from courthouses across the land, the school curricula from the earliest grades had to be scrubbed of God and His ways, and the old God’s morality must be relentlessly challenged and defeated, using the court system where necessary, in order to override the more conservative will of the people. Does any of that sound familiar? Of course all government needs financial support from the people to do its necessary work. And it has necessary work. God has ordained human government to protect the innocent and to punish evildoers. But, the more that government expands beyond its rightful bounds, the bigger it will become and the more of your personal wealth will be required to feed its growing habits. The bigger it grows, the more powerful it becomes and the greater greed it has for even more power. The government’s “servants” will get the best of your goods – they will live better than you do – on your dime. And you will be their “slaves,” in essence, giving them whatever they demand and doing whatever they say, or else. An out of control expansionist government is like the Blob of 1950s science fiction fame, swallowing everything in its path, leaving a greasy trail in its wake – a greasy trail and a whole lot of debt! That thundering burp you hear may be all that is left of your inheritance. If that isn’t bad enough, an out of control government will insert itself into religious areas that are none of its legitimate concern at all. It wasn’t long before King Saul expanded his governing sphere into the religious realm. He claimed he had to “force” himself to take Samuel’s place (the religious domain) and offer the burnt offering. (1 Samuel 13:8-12). This was a bit of theatre for the people to give the pretense of serving God while taking control of the moral compass. Saul also became very jealous of any honor offered to anyone other than himself, such as the high honor rightly accorded by the people to the warrior David. Similarly, government is a jealous god. And, when the government steps out of its rightful role, it seems to perform much like the Keystone Kops, falling all over itself to fix the very problems it created, and always seeming to make things worse! I’m from the government, and I’m here to help…uh huh. What changed was the moral compass. 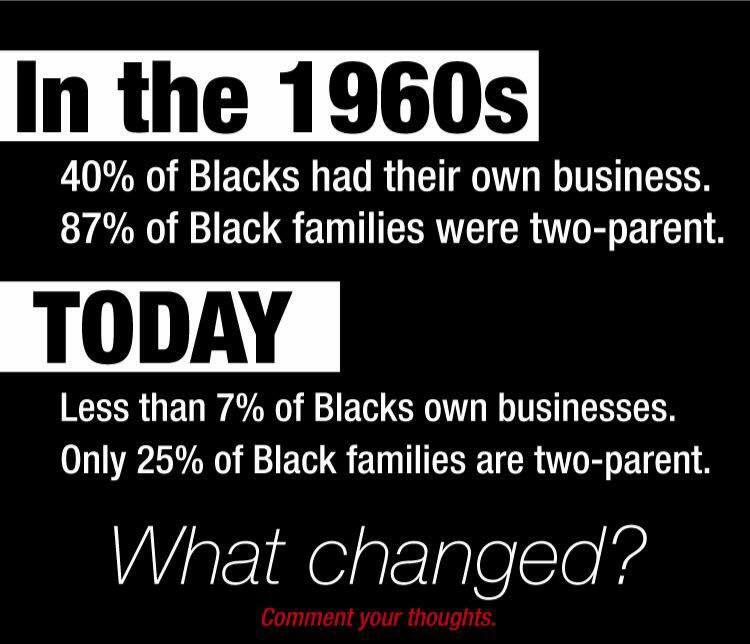 The meme presents the effects that the government’s “help” had on one segment of our society, but this is not a black issue. It is a human issue. Gargantuan government is making beggars of us all. Government cannot “fix” things, because government comes at problems from a fallen human (materialistic) perspective. Free money just isn’t the answer to everything. In fact, it’s not the answer to much of anything, but it is government’s favorite tool. They can use it for bribery, they can punish states and businesses by withholding it, or they can use it to wallpaper their congressional bathrooms – but it never gets at the heart of the problem. God, the real God, is central to informing us who we are and how we should behave. Marriage was a union between a male and female who together produced, cared for, and raised children. There was a personal moral responsibility to these relationships. Two parent families with a male and female role model were the norm. Taking personal responsibility for the family and individual economic circumstance was the morally responsible way to live and was often rewarded. Being peer accountable to the community was thought of as normal. Even if an individual or family were poor, they had a sense of pride and personal respect. Taking a “handout” was not taken lightly. The one helping had a sense of doing good, the one receiving was appreciative, and when their financial picture changed (for most poverty is a temporary condition) they would help others as they remembered how someone had cared for them. 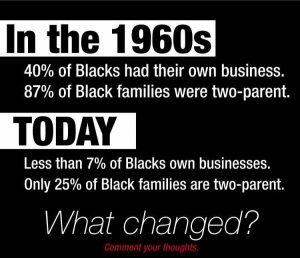 In the 1960s, the “war on poverty” was declared, which often made government the “daddy,” and removed personal responsibility. It changed the structure of the family and created dependence on the Federal Government rather than on God. Women were financially rewarded for having children out of wedlock, and more children meant more government benefits. In certain communities it became the norm for children to grow up in single parent homes without a father. The children in turn became dependents to the State. So too, the so-called nanny-state also relieved grown children of the responsibility to provide for parents or other family members, and it also encroached upon the churches’ mission of meeting the needs of the poor. By the end of the 20th century, sexual morality was fundamentally changed and continues the slide – to not only affirming but celebrating sexual behavior which God has decreed is wrong. The Federal government is now heavily pressuring churches and Christians, in 2016, to change their theology and teaching to accommodate the government’s new moral guidelines. The fear of God is completely gone from the halls of government. Definitely, we are in a spiritual battle. It is easy to forget the main stage where we must fight this battle, though. It is not from the bully pulpits of our culture, but within our own hearts. We can’t control our gov’t from the voting booth or the perceptions of our neighbors by the force of our rhetoric, but by the grace of the Holy Spirit we can yield our own heart daily in full allegiance to Jesus. Following in the footsteps of our Lord, and unlike worldly powers, we can become willing to set aside our egos and lay down our lives in service to our neighbor for the love of Jesus Christ and in confession of the Truth, no matter the cost. That is always where the real battle has to be played out, and where it will be won or lost. They hustle and scheme without moral compass , trying to survive by making accommodations that are at best temporary, more often delusional.